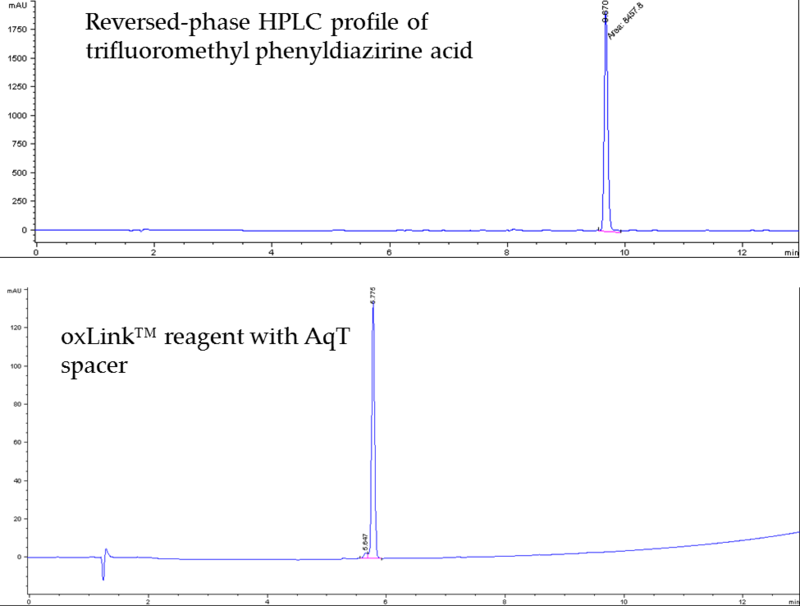 oxLink™ and sxLink™ reagents are set of photocrosslinking reagents with an aminooxy or a thiol functional group that is capable of forming a reversible linkage for purification purpose. Upon photolysis, carbene generated from the phenyldiazirine of the linker forms a covalent bond with the interacting proteins. The crosslinked proteins are then digested; the reversible linkage allows efficient purification/enrichment of the crosslinked peptides. Upon fragmentation, these peptides generate signature ions for the identification and quantitation of crosslinked products. General structure of a sxLink™ reagent (linker can be ethylene, ethylene glycol, or AqT™ linker). General structure of a oxLink™ reagent (linker can be ethylene, ethylene glycol, or AqT™ linker). Protein-protein interactions play an important role in regulating physiological functions in cells, such as gene expression, transport, signal transduction, and cell cycle control. Identification of interacting protein partners and the protein contact sites involved can facilitate understanding of protein function and aid in developing novel therapeutic treatments and diagnostic methods. Crosslinking reagents are promising tools for studying protein-protein interactions. 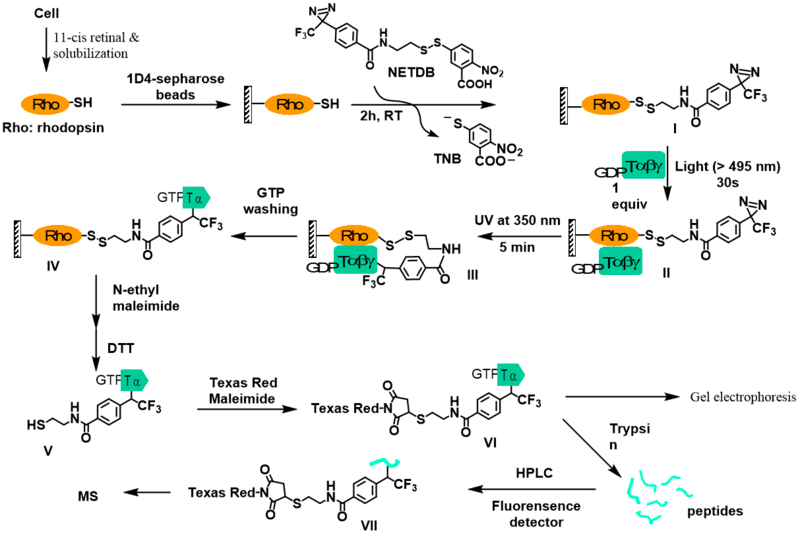 In general, crosslinking reagents are small organic molecules containing two chemical groups (bifunctional) that react with the functional groups on the side chains of proteins. Proteins in proximity to one another can be connected covalently via crosslinking reagents. There are two types of crosslinking reagents. The first type is photoactivable crosslinkers, which can be incorporated by photolysis. The second type is chemical crosslinkers, which can be incorporated under particular chemical conditions. Covalent crosslinking using photoactivable reagents is a preferred method for studying transient protein-protein interactions due to their highly reactive and non-specific insertion properties with any proximal C-H bond. A schematic example of how a reversible photocrosslinking reagent helps detect transient rhodopsin-transducin complex . Work was done in Khorana's laboratory at MIT. 1. Sale, lease, license or other transfer of the material or any material derived or produced from it. 2. Sale, lease, license or other grant of rights to use this material or any material derived or produced from it. 3. Use of this material to perform services for a fee for third parties, including contract research and drug screening. If you are interested in using oxLink™ and sxLink™ reagents for commercial usage, please contact us for more information.